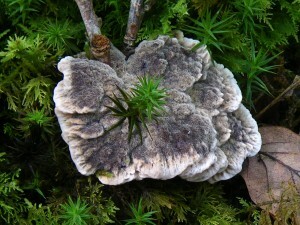 A group from the British Mycological Society started the ball rolling with fungus recording in 2007. They mustered a list of over a hundred species varying from the ergot on the flowers of purple moor-grass in the marsh, to the sweet poison pie growing with the willow in the wet woodland. One specimen they collected was re-examined four years later and found to be Stereopsis hiscens– only recently discovered in the UK, a few miles away near Pembroke. The drier fields here are rich in pinkgills and waxcaps, often in colourful clusters. We’re finding unusual fungi in the woods too. Our aspens have three rare boletes- Leccinum albostipitatum, Leccinum aurantiacum and the slate bolete Leccinum duriusculum. The hazel woods have the snakeskin grisette Amanita inaurata and the oak bolete Boletus appendiculatus. 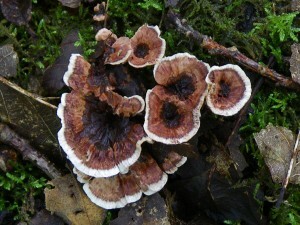 The ancient stream and wood banks around the farm have proved to be the best locations for rare fungi. The latter hold three rare tooth fungi (the zoned tooth Hydnellum concrescens, velvet tooth Hydnellum spongiosipes and the fused tooth Phellodon confluens), the green earth-tongue Microglossum viride and the knights Tricholoma columbetta and Tricholoma sejunctum. 2013 proved to be a spectacular year for woodland fungi. A summary of 2013’s discoveries (Fungi 2013) is available. 2014 has not disappointed with the new fungi that have been discovered on the farm. The star was perhaps the amethyst waxcap, Hygrocybe viola, with this being the first Welsh record for this red-listed species. Further details of this and other good finds are available (Violet Waxcap).